Powers/Abilities: The Silver Scorpion is an excellent fighter, skilled in jui-jitsu. 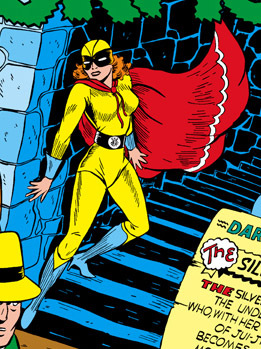 By the Silver Age, she had gained a suit of armour with a built in "sting-ray". History: (Daring Mystery Comics #7, g.a.) Betty Barstow worked as a secretary for private eye Dan Hurley. While driving to a costume party she stumbled on a crime in progress, and being a good citizen she stepped in to thwart it, using her knowledge of jui-jitsu to deal with the crooks. Enjoying the adrenaline rush, Betty decided to pursue a career as a costumed crimefighter using the name, The Silver Scorpion. (Daring Mystery Comics #8, g.a.) No synopsis available. (Comedy Comics #9, g.a.) 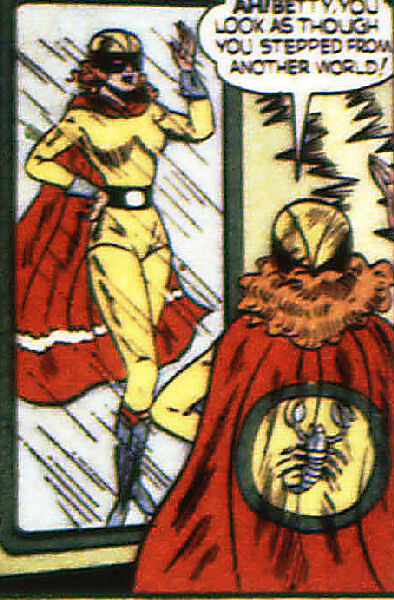 The Silver Scorpion faced Mr.Black, a villain who had somehow stolen an actress' youth. (Invaders II #2-4) When the Battle-Axis (superpowered agents of the Nazis) attacked UCLA's Science Complex and murdered both Dan Hurley and scientist Professor Carson (who had equipped her with a new suit of armour), the Silver Scorpion teamed up with Captain America and Miss America to fight them. She joined the Invaders, and together they eventually thwarted the Battle-Axis' ultimate plan. (Citizen V and the V-Battalion I #2, fb) In 1946 the Silver Scorpion was recruited into the Penance Council of the V-Battalion, a group formed by wartime heroes who sought to ensure the another such conflict could not occur, nor could another Hitler ever threaten the peace of the world. In 1953 she attended the funeral of Union Jack, who had died in a car crash. She was also involved in a mission where the Battalion discovered the corpses of alien shapeshifters (the Skrulls), thus uncovering the first steps in a planned invasion from outer space. (Thunderbolts #39-40, 46-50) No synopses available. (Citizen V and the V-Battalion #1-3) No synopses available. (Citizen V and the V-Battalion: Everlasting #1-4) No synopses available. Comments: Created by Henry Sable.